Deolinda is indie neofado’s wolf in sheep’s clothing. Indie neofado is a relatively recent movement in which Portuguese musicians combine fado poetics, melodies, harmonies, aesthetics, thematics, etc. with a sound, style, lyricism, and ethos traditionally associated with the multitude of subgenres that make up the contemporary international independent music scene. The indie neofado sound and makeup is as diverse as indie itself; the bands that comprise it falling along a wide spectrum of indieness vs. fadoness. The five-piece Novembro, for instance, borrows the wall-of-sound distortion, the slow-driving-4:4 beat, and the lyrical melancholy of the indie shoegaze tradition but substitutes the electric guitar for an electric Portuguese guitar, which is run through an array of effects pedals. Similarly, the original concept for the neofado-trip hop band, A Naifa, was a standard four-piece indie-electronic setup (drums, bass, samplers, guitar and vocals) with the amplified acoustic Portuguese guitar replacing the electric. Although alike in makeup, Novembro and A Naifa are on opposite ends of the indie-fado spectrum for a number of reasons. Space prohibits a detailed comparison and contrast of Novembro and A Naifa, but a focus on just the guitars provides insight toward each group’s distinct aesthetic choices: whereas A Naifa’s Luís Varatojo tunes his acoustic Portuguese guitar to DABEAB (the standard tuning for a Lisbon Portuguese guitar) and mostly picks the strings in a traditional fado manner while seated, Novembro’s Miguel Filipe tunes his effects-laden electric Portuguese guitar to EADGBE (the standard tuning for a classical guitar) and strums traditional rock or pop chords with a performative stance akin to the shoegazer (guitar slung to the waist, standing upright, head down). Nevertheless, the commonality that they share is the fundamental trait that distinguishes neofado from its predecessor, novo fado, in that it approaches fado from outside the tradition. All neofado musicians grew up surrounded by fado music but—either disdainful or indifferent to this Portuguese urban folk music—chose to begin their musical careers composing and performing some form of indie or electronic music before later embracing certain aspects of fado tradition. The indie neofado movement could be seen as the product of a collective disenchantment with modern society. It addresses a desire to return to a simple, scaled back, sparse sound that functions as a cathartic release for the newfound tensions resulting from the blistering pace of the internet age. Indie neofado is driven by a kind of nostalgia that looks back euphorically to a lost past. It is not a nostalgia that hopes for the restoration of empire or conservative authoritarian regimes. Quite the opposite, it is a nostalgia that revels in many of the resistant cultures that survived in spite of dictatorships. As a comparison one can look to various waves of other quintessentially nostalgic folk revivals in the United States around the turn of the twentieth century as a musical palliative for urban neurasthenia, the result of major social upheavals wrought by rampant industrialization. This urban delirium was temporarily cured through the advent of a Great Depression-era folk revival (led by musicians like Woody Guthrie, Lead Belly, and Burl Ives) addressing a sonic need for introspection and a return to simpler times; while also challenging the corrupt powers-that-be that had found financial success through the exploitation of the poor and disenfranchised. The changes in communication power brought about by the internet combined with the increased concentration of resources into the international reach of the extremely wealthy have produced a similar atmosphere today. The socio-economic characteristics of the first decade of the twenty-first century seem to replicate in some ways the environment that produced the traditional music that this wave of international neofolk now references. The present-day impulse to slow down and embrace one’s roots, as a reaction to internet-fuelled neurasthenia, is a foundational facet of indie neofado musical and lyrical production. However, the following study will explore a flipside of this phenomenon: Like the many late nineteenth-century nerve tonics—created to alleviate neurasthenia by stimulating the mind with cocaine and caffeine while soothing the central nervous system with opiates and/or alcohol—the indie neofado band Deolinda performs music that jolts as it mollifies. Deolinda’s innocuous revolution is comprised of elliptical and ironic lyrics which whisper of an urgency in the forced stasis of national economic stagnation; which shout against an idle complacency in the self-imposed immobility of the geração à rasca (generation scraping by). Deolinda is currently the most famous neofado group in Portugal. Deolinda is heavily inspired by fado, but only obliquely evokes this generic influence in their musical production—the brooding regret associated with Lisbon toponyms and fado itself (“Lisboa não é a cidade perfeita”); the playful rise and fall of the sprightly fado corrido (i.e. “Fon fon fon”); a nostalgic yearning for the national traditions of yesteryear and the sense of communitas that they fostered (i.e. “Um contra o outro”). Likewise, Deolinda practices an indirect form of protest music which has its roots in the música de intervenção tradition led by Portuguese folk musicians, a cultural catalyst which helped pave the way for the April 25th, 1974, Revolução dos Cravos (Carnation Revolution). This practically bloodless coup put an end to nearly five decades of António de Oliveira Salazar´s Estado Novo dictatorship. During the late Salazar regime, música de intervenção musicians such as José (or Zeca) Afonso, José Mário Branco, Manuel Freire, Fausto, Sérgio Godinho, and Paulo de Carvalho formed the artistic wing of a leftist resistance movement that defiantly sang subversive (but often cautiously symbolic and cryptic) songs about liberty, democracy, and equal rights. Despite the coded metaphors used by many of these singer-songwriters they were often hounded, arrested, or exiled by the Portuguese political police. Deolinda continues in this tradition by presenting an understated subversion via an interesting combination of lullaby and indie-bubblegum-fado-pop musical creation. This innocent form disguises a politically-charged content. Some of the lyrics produced by ex-jazz-punk neofadista, Ana Bacalhau, become strikingly caustic when performed by a singer who embodies such a harmless personage. Bacalhau’s performative theatrics, stage banter, and spritely intonations recall the tactics employed by a kindergarten school teacher attempting to keep the listless attention of her young audience. Fig. 1. Deolinda. “Deolinda: Canção ao lado.” Liner notes. Canção ao lado. Iplay/World Connection, 2008. CD. Through press releases, album artwork, and live performance, Deolinda portray themselves as nothing more than a playful pop four-piece that dabbles in the lighter side of Portuguese folk (see fig. 1). Deolinda is innocent, kind, optimistic, respectful, nostalgic, and completely in love with fado and all aspects of national folklore and culture. 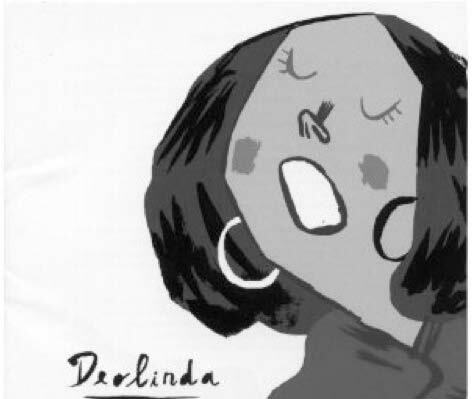 Deolinda is portrayed as a cartoon on the first two of the band´s album covers. The band’s lyrics are written from her innocent perspective as she observes contemporary Portuguese life. Nevertheless, the point of view of this cartoonish little girl is far from naïve. Deolinda guitarist and composer, Pedro da Silva Martins, collaborates with Ana Bacalhau and other band members to devise lyrics vis-à-vis the naïve yet insightful perspective of this young lady: Deolinda loves Portugal, but she also sees its flaws. She does not pull any punches. In her simple worldview, we see all of the coercive national discourses, all the arbitrary prejudice, and all the unfair rules which undergird the national and international structural realities. Silva Martins and Bacalhau meditate on Deolinda’s childlike perspective so that they may make conscious the everyday ideology which is profoundly unconscious. The child protagonist perceives those ideological structures which are invisible to us precisely due to their transparent and “natural” position in the existing scheme of things from a drastically different worldview, one that renders these ideological structures visible as indeed uncommon and unnatural. Deolinda’s adolescent insight, as voiced by Bacalhau, has helped to form the foundation of a Portuguese youth movement which has taken to the street in protest over the turn-of-the-decade economic crisis and externally-imposed austerity measures. Several national journalists have pointed to this protest movement as a template for the Spanish indignados and, therefore, the U.S. occupy movements. Ana Bacalhau had to rewrite her own biographical narrative—a metamorphosis from fado-jazz punker to indie folk-pop darling when Deolinda was formed out of the ashes of Bacalhau’s prior band Lupanar (2001-2006). Lupanar (derived from an antiquated Portuguese term meaning brothel) blended fado with experimental jazz and punk, attempting to recreate lyrically the macabre cut-and-paste pastiche of the ransom letter. The sarcastic and raucous experimentalism of Lupanar would be funneled into the dulcet-toned, and understated lyrical subversion of Deolinda. Whereas the music and lyrics of Lupanar seemed to be heavily influenced by early 80’s Portuguese experimental indie bands such as Mler Ife Dada and Ocaso Épico, Deolinda tends more toward the whimsical sonic dreaminess of Madredeus or the playful, jaunty side of Amália Rodrigues (i.e. “Formiga bossa nova,” “Caldeirada poluição,” “Senhor extraterrestre,” etc.). Bacalhau’s cultivated innocence is a disguise which is reinforced by the band’s musical mask of the twee, together serving effectively as visual/sonic opium for her young and old, liberal and conservative, Portuguese audience. As the performance, music and vocal intonation lulls, the lyrics subtly prick the subconscious. For Cave, the absence of saudade is a symptom of a general disintegration of authentic expression in contemporary musical creation. The music that Cave condemns is the empty product of major label industry algorithms based on reductive market analyses, which only serve to reproduce a brainwashed, consumerist citizenry. The composer of such lyrical and musical atrocities may find a ready market to purchase his albums, as the present-day culture industry proves. However, Cave claims that this is not an affirmation of said musician’s poetic skills, but rather his charlatanism—his ability to repeatedly take his doped and duped audience for a ride. Saudade has the potential to rip the bandages from the eyes of this global collective which has been continually hypnotized by the vapid content of the modern-day love song. Deolinda’s critique of these songs, which have “to be pretty,” centres around saudade and the (self)-censorship involved in the Lisbon fado experience from Salazar onwards. Nevertheless, these lyrics could also be interpreted in dialogue with a broader phenomenon of vacuous mainstream pop lyricism due to its own inherent self-censored nature. The primary problem expressed in the song was easy to decode. What to do about it—two years into the Eurozone crisis—was not so clear. International concerns that Portugal would soon need to be bailed out like Greece led to increased calls for austerity measures from the European Union and the International Monetary Fund. Socialist Prime Minister José Socrates submitted his resignation on March 23rd, 2011, shortly after the Portuguese parliament had rejected his final proposal for austerity measures. On May 16th, 2011, Eurozone leaders agreed on a €78 billion bailout for Portugal to be equally split between the European Financial Stabilization Mechanism, the European Financial Stability Facility, and the IMF. Socrates (and several other governmental leaders within the Socialist party) would be replaced after elections in June by members of the Portuguese Social Democratic Party, led by Pedro Passos Coelho. The Eurozone leaders had hopes that new leadership could help tame the Portuguese deficit via IMF-sanctioned restrictions on national social expenditures. The new externally-imposed austerity measures would gradually, yet drastically, affect the Portuguese youth that Deolinda helped to reinvigorate. With the first quarter, 2012, youth unemployment rate hovering near 30%, Portuguese government pressed ahead with reforms to introduce more flexibility into labour markets: “Arménio Carlos, the CGTP leader, said the government’s austerity measures and labour reforms would result in many workers seeing their wages drop by up to 25%. On top of pay cuts and tax increases, the measures will make it easier and cheaper for companies to fire workers, will introduce more flexible timetables, and will cut holidays and overtime rates” (“Portugal’s strike: General indifference”). The hope for Portuguese government officials is that the greater flexibility provided to national and international corporations to hire and fire will reduce unemployment since businesses effectively would take on less risk now when hiring, given that firing will not be as costly as it had been before. The results of these measures by the end of first quarter, 2013, have been rather disappointing both with respect to youth unemployment which rose 2.6% over the year to 38.3% (“Portugal Youth Unemployment Rate”), as well as overall national unemployment, rising 2.4% to reach 17.5% (“Portugal Unemployment Rate”). Ana Bacalhau continues to sing from the perspective of the little cartoon Deolinda as they now tour in support of their most recent release Mundo pequenino (2013). Her demeanor onstage is as innocent, gentle, and gracious as one would imagine Deolinda to be, were the little Portuguesa to spring from the album artwork. The Deolinda audience mimics Bacalhau’s onomatopoeias and physical gestures as if they were themselves as young as the band’s cartoon protagonist. Perhaps it is therapeutic to revert to this child-like state, to lose oneself in a Zen-like trance, to forget that the country is practically insolvent and that the government will slash all spending if need be to emerge from this financial quagmire. The distancing effect of Deolinda’s whimsical indie neofado pop performances evokes a sense of nostalgic equilibrium that slowly dissipates as the music fades. The Deolinda audience member buys the CD after the show, reads the liner notes and sings along with Bacalhau, then quickly begins to read between the verses, interpreting “that which is said by not saying.” There are various levels of inactivity implied by the lullaby genre, by Deolinda’s oblique employment of a politically dormant Portuguese urban folk aesthetic, by not saying something, by the distancing effect, by the schizophrenic paralysis of the geração à rasca, or by the hypnotic, childlike nostalgia play of the concert spectator. And yet, the end result was anything but quiescence. Deolinda’s lullabye-pop neofado lyrics were chanted in every protest march I attended during 2010-2011. As the increasingly suffocating austerity measures continue to force droves of unemployed or underemployed Portuguese youth to return to their parent’s homes, this new Deolinda-style protest song calls them in whispers to recognize their collective forced stasis and unifies them in shouts to finally turn off the tele and take to the streets. Apps, Peter. “Wall Street Action Part of Global ‘Arab Spring’?” Reuters.com. Reuters. 11 October 2011. Web. 15 March 2012. Cave, Nick. “The Secret Life of the Love Song.” The Complete Lyrics 1978-2007. London: Penguin, 2007. Print. Gallop, Rodney. “The Fado (The Portuguese Song of Fate).” The Musical Quarterly. 19.2 (1933): 199-213. Print. Lusa. “Deolinda, o grupo que dá voz à ‘geração à rasca.’” Dn.pt. Diário de Notícias, 12 March 2011. Web. 15 March 2012. “Parvo ou não, eis a questão.” Timeout.sapo.pt. Time Out Lisboa. 20 February 2011. Web. 8 February 2011. “Portugal´s Strike: General indifference.” Economist.com. The Economist, 22 March 2012. Web. 29 March 2012. “Portugal Unemployment Rate: 17.50% for Mar 2013.” Ycharts, n.d. Web. 26 May 2013. “Portugal Youth Unemployment Rate: 38.30% for Mar 2013.” Ycharts, n.d. Web. 26 May 2013. Silva Martins, Pedro da and Deolinda. “Fado castigo.” Canção ao lado. Iplay/World Connection, 2008. CD. —. “Movimento Perpétuo Associativo.” Canção ao lado. Iplay/World Connection, 2008. CD. —. “Parva que eu sou.” Deolinda ao vivo no Coliseu dos Recreios. Sons em trânsito, 2011. CD.